· Leading indicators support most growth forecasts. There is always a year-end flurry among economists to focus on the year ahead growth forecast. For the last few years, this has resulted in expressions of disappointment that the year just finished didn’t live up to expectations combined with upbeat forecasts that “next year will be better!” The same is true this year. 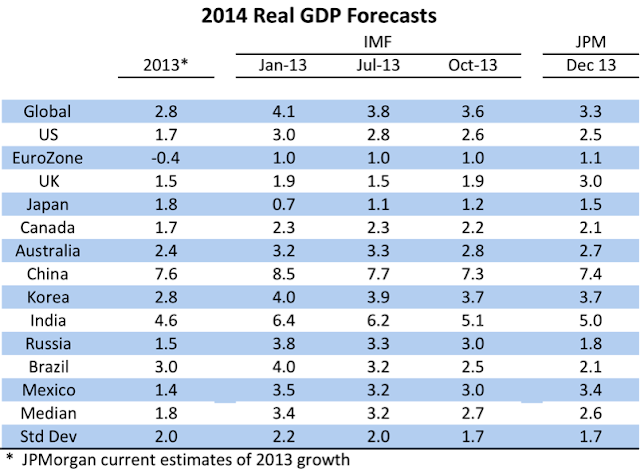 Last year, global growth was expected by the IMF to pick up to 3.5% in 2013 from 3.2% in 2012. Instead, global growth is now estimated to have slowed to 2.8% in 2013. This year, forecasters tell us once again that global growth will pick up from a disappointing 2.8% in 2013 to 3.6% (IMF October forecast) or 3.3% (JPMorgan December forecast). This forecast for 2014 is presented as upbeat news, but the reality is that the 2014 forecast for has already faded from the 4.1% forecast published by the IMF in January 2013. In most countries, growth is expected to pick up in 2014. Economies with the largest forecast pickup in growth include Mexico (3.4% vs 1.4%), UK (3.0% vs 1.5%), Eurozone (1.1% vs -0.4%), Korea (3.7% vs 2.8%) and US (2.5% vs 1.7%). Modest growth improvements are expected in Canada, Australia, India and Russia. In two major countries -- China and Brazil -- growth is expected to slow in 2014. While global growth is expected to pick up in 2014, the divergence between DM and EM growth that began in 2013 is expected to continue. In the chart below, the blue bars show the 2014 growth forecast versus the trend growth rate for each economy. In 2013, Japan was the only major country to post growth above the OECD estimate of its trend growth rate. In 2014, the larger DM economies are expected to grow well above trend, while Canada and Australia are expected to grow around trend. In contrast, all of the major EM economies, except Mexico, are expected to grow well below trend. 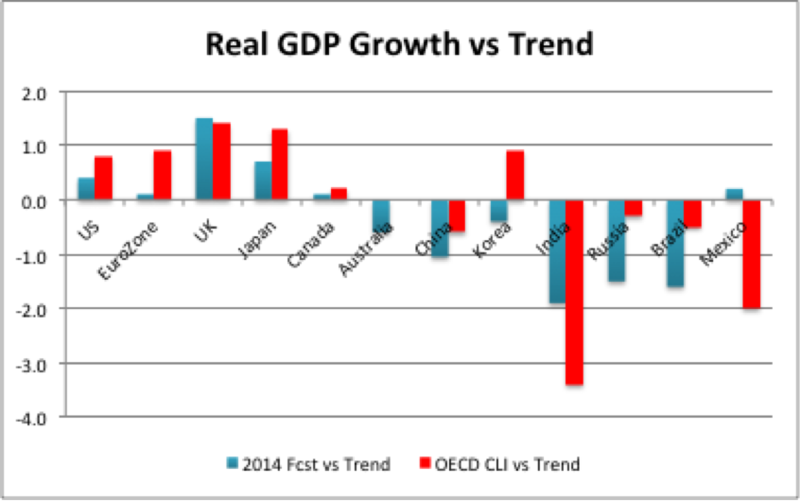 In the chart above, the red bars show the latest OECD composite leading indicators (CLIs) for each of the economies. These CLIs support 2014 growth forecasts, with a few exceptions. In the DM economies, the leading indicators suggest that growth could surprise on the upside in US, Eurozone and Japan. In Japan, however, the low forecast relative to the CLI reflects the expected effect of a significant increase in the consumption tax. In the EM economies, CLIs suggest that growth could be stronger than expected, but still below trend in China, Russia and Brazil. On the other hand, CLIs suggest that growth forecasts for India and Mexico may be significantly too optimistic. Will 2014 be the year that the major DM economies finally shake off deleveraging and fiscal austerity and move to above trend growth? If so, global bond yields are likely to rise as markets price in less accommodative monetary policies. Will 2014 be another year of below trend growth for the major EM economies? If so, commodity prices are likely to remain weak and capital is likely to continue to flow out of EM economies. The question one should ask about 2014 forecasts is this: Can still highly indebted DM economies sustain above-trend real GDP growth in an environment of rising real interest rates and below-trend EM growth? Or will we look back on 2014 as another year that started with optimistic forecasts and ended with disappointment? I suggest that investors should stay on their toes. Ted Carmichael is Founding Partner of Ted Carmichael Global Macro. Previously, he held positions as Chief Canadian Economist with JP Morgan Canada and Managing Director, Global Macro Portfolio, OMERS Capital Markets. if global growth for dm does arrive where do you see ten bond rates?